This study investigated the impact of age, knee joint angle, and strength testing modality on lower body maximal and rapid strength production and assessed the transferability of these characteristics to mobility-related function. Twenty young (age=21.9 yrs) and eighteen elderly (71.1 yrs) adults performed single-joint and multiple-joint isometric maximal voluntary contractions at three knee angles. Outcome measures included peak torque (PT), rate of torque development (RTD), jump height, power, 10 and 400 m walk, and timed chair stand. Older adults exhibited greater reductions in RTD for the multiple-joint (45%) than for the single-joint mode (18%). The 10 m walk was best predicted by multiple-joint RTD at 90°, the 400 m walk by jump height, and the chair stand by single-joint PT at 20°. 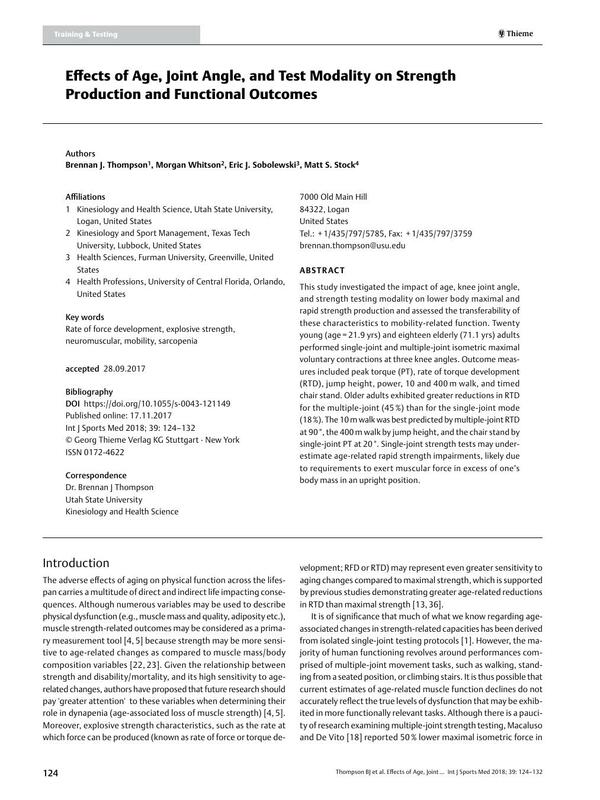 Single-joint strength tests may underestimate age-related rapid strength impairments, likely due to requirements to exert muscular force in excess of one’s body mass in an upright position.